Creating a mobile commerce app for your store is a great way to increase engagement, conversions and sales for your business. But only if people decide to download your app in the first place. 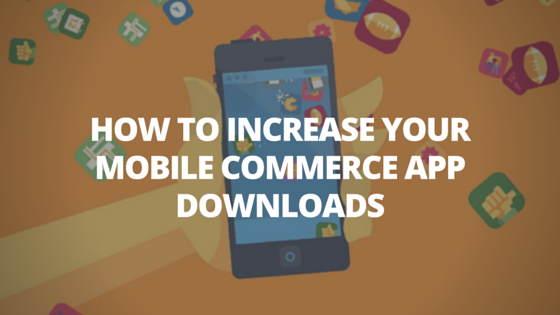 In this post we have decided to gather some of the best ways to increase your mobile commerce app downloads. The single best way to ensure lots of downloads for your mobile eCommerce app is to create a pre-launch campaign. That way you will build awareness and demand for your app way before you release it. And when you do so people will be eagered to download it. Announce it in advance before launch – this is a key step for your success. You should let your audience know as soon as possible that you’re working on an app what will allow them to shop with their smartphones. After that you should regularly engage with your audience and let them know how the development process is working. This will further engage them and create anticipation. Be sure to grow your social media followers and email list. They are key channels for communicating with your community. Also feel free to create content related to the development process. This could be anything from blog posts, videos, press releases you send to the media, etc. Build a list of early adopters – allow people to become beta testers and get early access to your mobile app. Create a separate landing page with an opt-in form for people to subscribe for your launch. Write a clear value proposition and let them know what they will get if they subscribe in advance. Drive traffic to this landing page from your homepage and other internal pages on your website. Just place a banner on the side or use a top bar with a call-to-action. That way all your visitors will know about the upcoming launch. You can further promote your landing page with Facebook ads, AdWords and retargeting. Test your app and ask for feedback – before you submit your app to App Store and Google play you want to be sure that it is user friendly and it works smoothly. The worst thing is to submit an app that is filled with bugs and it crashes all the time. The best way to avoid that is to let your early adopters or so called beta testers try your app. That way they can provide you with feedback before you launch it. When they do so you can easily identify and fix all bugs. Launch – keep in mind that your app needs to be pre-approved by the store before you can launch it. That’s why it’s smart to submit it in advance. Additionally, you should know that Google or Apple might ask you to make changes to your app in order to fit their guidelines. One of the best ways to get more downloads for your mobile commerce app is to optimize it for the keywords people are searching within the stores. This process is called App Store Optimization and it is very similar for both Apple’s App store and Google’s Play Store. App name – the way you name your app makes a huge difference when it comes to how many people will find and download it. Be sure to include your brand name. This is what people that know you will be looking for. Additionally, within the app name you can include any keyword that best describes what it is about. App keywords – you can include a set of keywords for which to optimize your app within the store. Be very careful when choosing them to ensure you will attract your desired audience to your app page. To pick the right keywords you should do a keyword analysis and find those your customers are more likely to use when searching within the app store. You should continually optimize and test new keywords to see which ones perform better. As the most important KPI that you should track here are the number of downloads. So do the new keywords increase or decrease your downloads? Number of downloads – they highly affect how well your rank in the app store. The more downloads you have for that app the higher you’re going to rank. That’s why it is so critical to create a pre-launch campaign because this will pump your download from day 1. You should also use any other ways to additionally promote your app and increase downloads. We will further talk about this in this post but you should know that this will also help you rank higher in the app store’s search engine. Ratings and reviews – more reviews and higher ratings help your app rank higher within the app store. That’s why it’s so important to create a well-designed, user-friendly app that help people accomplish their goals easily. This is where your beta testers will contribute the most. They will first give you the feedback that you need to improve your app. Also they would be able to rate and review your app from day 1. Be sure to ask them to do so and don’t leave that to chance. Send them an email at the launch they and ask them to rate your app. Also, regularly ask people that use your app to do the same. Leverage your happy customers to generate more downloads and increase your app store rankings. App description – it has 2 main purposes here. First, you can write your description in a way to generate more downloads. Focus on your value proposition and what you offer to the customer. Enlist all your benefits and features that you app has. As well as any social proof – rewards (top app in Health & Fitness category), testimonials, media reviews, etc. Second, in your description you should once again include keywords that you believe will help you rank higher. App screenshots – this doesn’t directly affect your rankings within the app store. But having great app screenshots will trigger more downloads which will result in higher rankings. So think about screenshots that convince the user to take action and download your app. Show how it works in action and all the most important features. Be sure to fill out all available spaces for images. You can add up to 5 in the App Store and up to 8 in Google Play. App localization – translating and targeting your app for different countries and languages will further help you increase your search rankings. When you translate your app be sure to also adapt to cultural differences, customs, weight and measurement systems, currencies, date and time formats and anything else that might affect how people work with your app. Do you know that you can also optimize your mobile app for Google Search as well? That way your app page within the store will be shown in search results and this can drive you additional downloads. Include your brand in the app name and URL – in the app store be sure use your brand name in the anchor text point to your page. As well as in the URL of your app download page. Link to your app page from your website – a well-known fact is that high-quality relevant backlinks can help any page rank higher. Your app page is not an exception. So that’s why you should focus on building link to it as well. First, don’t forget to include a link from your website. Most importantly – your homepage and your site footer. You can create a special landing page for people to download your app with more information and links to your apps. Include brand name in anchor text pointing to your app URL – anchor text affects greatly how well your rank for certain keywords. Every time you link to your app be sure to include your brand keyword in the anchor text. Don’t make the mistake of using text such as “Download our iPhone app”. Your current website visitors and customers are the ones that should be the most interested into your mobile app. So use that traffic and direct it to your app page so more people can download it. Homepage banner – place a banner on your homepage and all other important pages on your website about your mobile app. This could be your category or product pages. The idea is to let know all visitors of your website that you also provide this amazing experience to them. When people click on the banner they should be taken to a specially designed page where they can learn more about your mobile commerce app and find the link to their app store. Convert mobile traffic – when people browse your website from a smartphone offer them a better experience with your mobile app. Your mobile visitors will be much more likely to download your app. They’re already browsing your site with your smartphones and it will easier for them to download it. Show a small message on the top of the screen. Don’t put a banner covering the entire screen. This will alienate people. Social media is one of the best ways to promote your app and get more downloads. You should use the channels that allow you to reach your target audience, whenever this is Facebook, Twitter, LinkedIn, Pinterest or something else. Share it on your profiles – you should always start with sharing your app with your current audience. They are the most likely to convert – they already know about your brain and some of them have even bought from you once or twice. Promote it with ads – another way to reach out beyond your own network is to advertising the app on social media. Facebook has an advertising option created especially for promoting apps. That way you reach out mobile users directly in their news feed. Ads are delivered as sponsored stories labeled Suggested app. Then people can like, comment, share or download your app. Twitter also allows you to promote your app with ads. Remember that 80% of their users are on mobile. Here you can target their mobile audience based on their demographics, interests and accounts they follow. Video is one of the most powerful ways of communication in 2016. That’s why we suggest you create, invest and promote a video dedicated to your app to drive more downloads. Make an explainer video for your commerce app – animated explainer videos are really trendy nowadays. You can create one to easily communicate the value proposition of your mobile app and why people should download it. You can easily outsource it and hire an agency to make it for you. There are companies like Spider Videos that focused on making exactly just that and can do it for an affordable price. Optimize it for YouTube Search – you should spend the time to optimize your video for YouTube Search. Uploading is simply not enough. The first step is to do your keyword research right so you know for which words to optimize. Beyond simply using your brand keyword you should find others that are related to your app and your audience is likely to use when using YouTube. Use your keywords in the filename before you upload it on YouTube. Make your video title as least 5 word long so you can include your main keyword without stuffing. Do the same thing with the description. Once again, focus on making your video great and engaging. You want people to watch bigger part of your video because video retention affects YouTube rankings. The same is true with comments, thumbs up, shares, favorites, subscribers after watching. The more you have them, the more likely you’re to rank higher. Use annotations and ask people to subscribe to your channel after they watched the video. This also helps. Promote it with TrueView ads – with them you can send mobile users within YouTube to the appropriate app store so they can download your mobile app. You can optimize your ad and include your app name, icon and ratings next to your video ad to drive more downloads. Which strategies would you implement from this post to generate more downloads of your mobilecommerce app? Let us know in the comments below. Also read the ‘Update Strategy to Boost App Downloads’.